Finding the right work environment last year for Brennan Murray, a Vista School student, was “a great learning experience,” according to Cathy Malloy, career developer. Using the Customized Employment discovery process, she took Brennan into the community to learn about his interests and abilities. That’s when an entirely new side of Brennan began to emerge. At a Hersheypark Job Fair, Cathy learned about a job called “SANI Sweeper.” The job consists of walking around the park and sweeping up trash left on the ground, on benches, and in the bushes. Brennan enjoyed this experience and was later taken back for a second job trial. This time, he stayed longer. “That’s when I knew this would be a good fit for Brennan,” Cathy said. Through negotiations with his supervisor, Michele Eiceman, Vista was able to secure the job for Brennan. He sat through a three-hour orientation, got his ID badge and wardrobe (uniforms), and worked last season two days a week for four hours a day. Hershey Entertainment & Resorts (HE&R) was so pleased with Brennan’s work and dedication to the job that they invited him to return this year – and gave him a raise. He will start working twice a week when the park opens in late May. Toward the end of last season, Brennan started to know others around him. He’d look at people and nod “hello.” When he’s there, coworkers look out for him. If it rains, they make sure he knows where he’s supposed to be. Brennan communicates by pointing to picture icons on a lanyard. In the future, after Vista fades away its support, the goal is for Brennan to be able to communicate without the lanyard. After Brennan graduates from The Vista School in 2018, Vista Adult Services staff will work on finding him a permanent job placement. 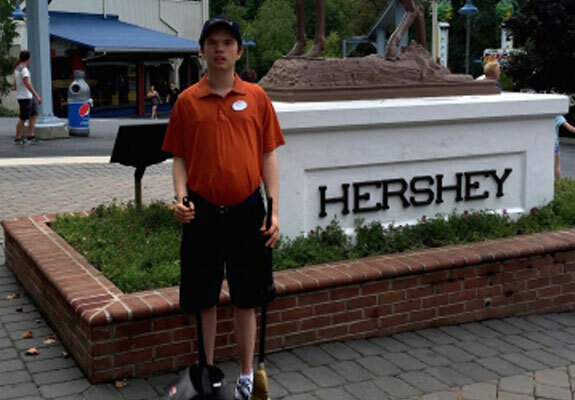 For now, though, Brennan is very much a part of the Hersheypark community.